From the Web – Why Bible Journal? Why Bible journal? What benefits does it have? Is it disrespectful to God’s word? Is it just coloring or just a trend? What if I don’t want to draw in my Bible? If you’ve ever asked any of these questions I’m trying to help you find the answers. I’ve pulled together some of the best posts I’ve found on the subject so far (and thrown in my opinion as well). I love Bible journaling. Bible journaling can be just words, just pictures, or any combination of the two. It can be done in your Bible or in a separate book. It can be elaborate artwork and calligraphy or a quickly done note or doodle. However we decide to express ourselves, for most of us who journal it’s about reacting to God’s word. It’s a way for us to remember a special passage, or personalize what we’ve read. It can also be a way for us to show what we’ve learned to God and others. Here are posts from half a dozen others about why they chose to journal. Bethany’s Why Bible Journaling is More than Just Random Coloring what’s wrong with having fun while you meditate on God’s word. Bible journaling, particularly art journaling is not for everyone. There’s nothing wrong with those who chose not to. God gives us all different types of creativity and gifts and some won’t gain as much from journaling as others. People who don’t find it their cup of tea shouldn’t try to stop those who really benefit from it. It’s defacing God’s word. I personally believe it’s the words that are sacred not the individual books that contain those words. While I don’t think we should ever be careless with or destructive to a Bible I don’t see writing notes, using color to draw attention to things, or drawing relevant (at least to the artist) pictures as taking away from God’s word at all. If drawing (or even writing) in your Bible feels wrong or uncomfortable you can always use a notebook instead (I did when I first started). I have found I’m reminded much more often and strongly of the lessons I’ve learned when the pictures are directly in my Bible though. But you’re covering up the words. Most (but not all) of the pictures you’ve seen with color over part of the writing you can see through it enough to still read the words when you have the Bible in your hands (and not just a picture of it). In those few instances where you can’t I can assure you most of the journalers have one (or more) other Bibles that they read and study from. I don’t personally know anyone that’s trying to ignore scripture by painting over it. Aren’t you just crafting (or playing) and not really studying. I’m sure there are a few people who Bible journal just because it’s “in” or to be crafting. It’s sometimes easy to get wrapped up in the wrong aspect of almost any activity. Most journalers though aren’t doing art instead of studying but as an addition to studying. We spend time meditating on the scripture trying to find the best way to add it to our margin so we won’t forget anything. We sing hymns, quote scripture to ourselves, and/or pray while doing the artwork to keep our thoughts God centered. I personally think we should encourage any activity that helps people put aside distractions and focus on God and I believe Bible journaling can be that to a lot of people if they approach it correctly. Here are 3 articles that I really like that deal with various objections. Valerie’s Sjodin’s Why I Bible Journal and Why I Don’t deals with the idea of sometimes the art getting in the way of prayer and study. Amanda Schenkenberger’s Is Bible Journaling Biblical? answers common objections including you’re adding to God’s word. Shana Noel’s Is Bible Journaling Just a Trend, explains how it’s so much more to her and she’ll still continue even if it’s trendiness goes away. I don’t think I have all the answers but I keep praying and talking to God about it. I also read lots of blog posts and books. 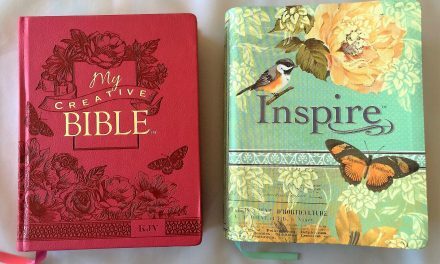 Both books give wonderful personalized accounts of what Bible journaling has meant to them. Jann’s book doesn’t answer all the journaling questions (everyone’s answers are different) but helps you ask the right questions to figure it out for yourself. Shanna’s book encourages (and convicts) you to find some way to interact with the Bible on a personal level (which won’t be art journaling for everyone) and share what God has done in your life. If you like the idea of journaling but aren’t ready (or willing) to start in a Bible and/or aren’t sure you want art to be a major aspect here are a couple of articles I really liked about other forms of journaling. Now it’s time for your opinion. Is there an article about Why Bible journal I missed you think others should read? 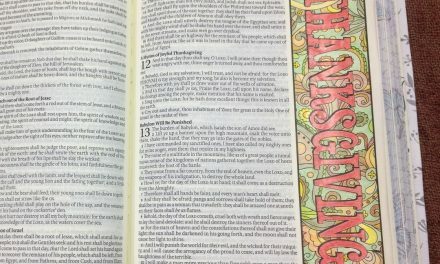 What do you think of Bible journaling? Do you think it’s here to stay or a trend whose time will soon be up? Do you Bible Journal? With words, pictures, or both? In your Bible or someplace separate? I’m planning on doing a series of these From the Web posts about all aspects of Bible journaling. I’m hoping to write a new post every 3 or 4 weeks. Did you find this post useful? What could I have done differently to make it better? Is there a specific topic you’d like me to cover? Is there a website or article I just have to read? Please share your answers or anything else relevant to the topic in the comments. Photography by hannah C brown. Screen shots from aimeeimbeau.com, valeriesjodin.com, and www.imperfecthomemaker.com.